It’s a book that’s shockingly unlike any 19th century British novel I’ve read before. In my mind, there’s a clear divide between 19th century British and French literature. French literature is concerned with the specifics of things: how businesses work, how ordinary people live, and how relationships come together and break apart. Whereas British literature is more broad strokes. It’s concerned with personalities and archetypes. French literature is serious; British literature is funny. French literature is primarily realist, while British literature is primarily Romantic. However, I guess there was a British realist movement after all, because this book is not funny, and its psychological portraits are very finely-grained. The book is ostensibly about a few struggling men (and women) of letters in the late 19th century, but like most British novels, the book is really about whether it’s possible to live a good life if you have no money. Most British novels, however, tend to elide this problem by having the protagonist magically inherit enough money somewhere in the 3rd act. That’s what makes them Romantic rather than Realist. British literature borrows all the angst and drama of not having enough money, but doesn’t want to worry about the consequences. Not to spoil anything, but New Grub Street does not do that. I think I can even pinpoint the exact moment when I realized that this book was playing by different rules. It was a few chapters in, when Edwin Reardon is having conflict with his wife, Amy, over his inability to write another novel, and their increasing financial straits. He asks her whether she still loves him, and she replies, “Oh yes! Of course!” (or something like that), but you start to realize that things are more complicated than that. She certainly has love for him, but it’s waning. Things aren’t what they used to be. This is one of the few 19th-century British novels that had me in genuine suspense throughout, because I was like, I don’t know. I genuinely do not know. Are Henry and Amy going to make it? Maybe. Maybe not. 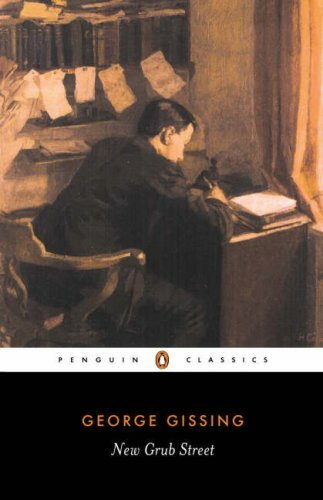 Anyway, it’s worth reading, if you’re in the mood for that sort of thing, which I apparently am, since I immediately started reading a 19th century Spanish realist novel: Benito Perez Galdos’ Tristana.